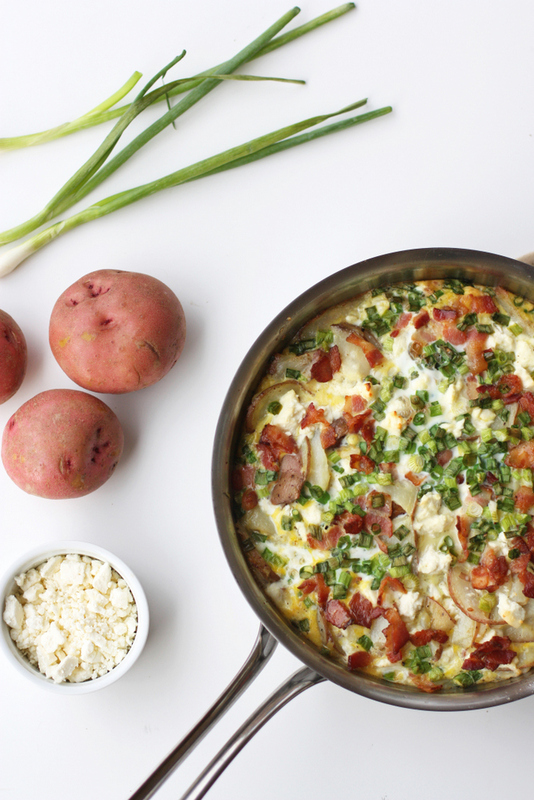 Have you tried a potato frittata recipe before? 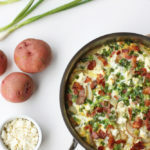 Most baked frittata recipes don’t appeal to me much because there is so much egg, but this bacon and potato frittata recipe has just the right ratios. Add in the feta and I’m all in! This potato frittata recipe has two really great qualities. The other good quality is that this baked frittata recipe is delicious. Not that either of my older children would know, since they refused to even taste it. Ani carefully slid her slice right back into the pan and Ella explained that she already knew she wouldn’t like it because she doesn’t like eggs or potatoes and usually not bacon either. Also, were those specks of black pepper in there? Because she doesn’t like that either. Bart and I didn’t push it because it just meant there were enough leftovers for us to have for lunch the next day. I also can’t blame them too much because it took me about 25 years to warm up to eggs and even in this case, I probably wouldn’t have tried it if my mom hadn’t made this baked frittata recipe when we were visiting. But one bite and I was a convert. Because it’s a potato frittata, it doesn’t feel so much like you’re eating a giant bite of baked eggs. 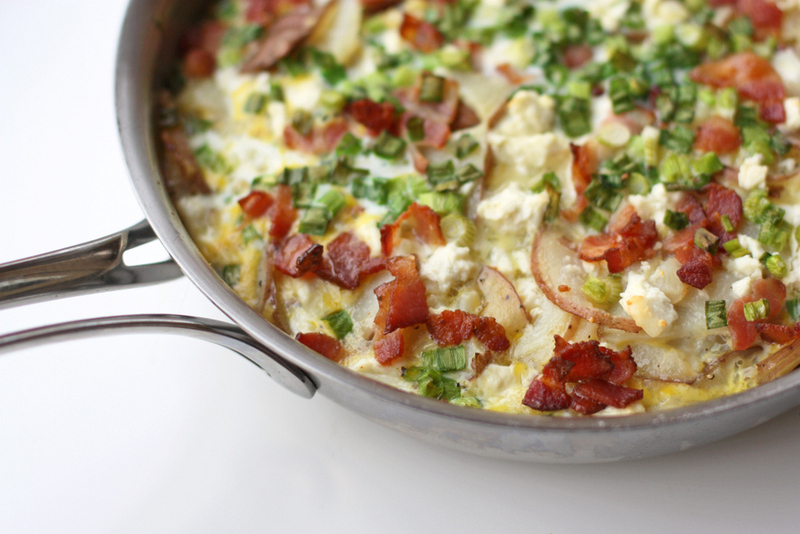 It has a perfect ratio of thin-sliced potatoes to eggs and the bacon and feta and green onions give it tons of flavor. I’d eat this for breakfast, lunch or dinner. (And I have). Preheat the oven to 400 degrees. Line a cookie sheet with tinfoil. Scrub the potatoes and then slice as thinly as you can (think potato chips). Lay them on the cookie sheet and drizzle the olive oil over the top. Toss to coat the potatoes with the oil, and salt and pepper generously to coat. Spread the potatoes evenly on the pan and then cook for 30-35 minutes, flipping them over halfway through. When they're tender, set them aside to cool for a few minutes and leave the oven on. While the potatoes are cooling, put the diced bacon in a cast iron or other oven-proof skillet. Cook until slightly crispy, then drain the bacon bits on a paper towel, leaving the grease in the pan. Depending on how greasy your bacon was, you may want to drain a little out - I left about 3 Tablespoons of bacon grease in the pan. Let it cool for a minute or two, then add the potatoes to the skillet and stir to coat. Sprinkle the bacon bits, the green onions and feta over the potatoes. Whisk together the eggs, milk and salt, and pour over the potatoes. Cover the skillet with foil and bake for 15 minutes. Remove the foil and bake another 15 minutes more, until the eggs are set. Besides being a yummy recipe, you are such a witty writer! Love your kids comments! Potato frittatas used to be one of my fall-back, nothing-defrosted-for-dinner dinners. My kids, unlike yours, will eat them. 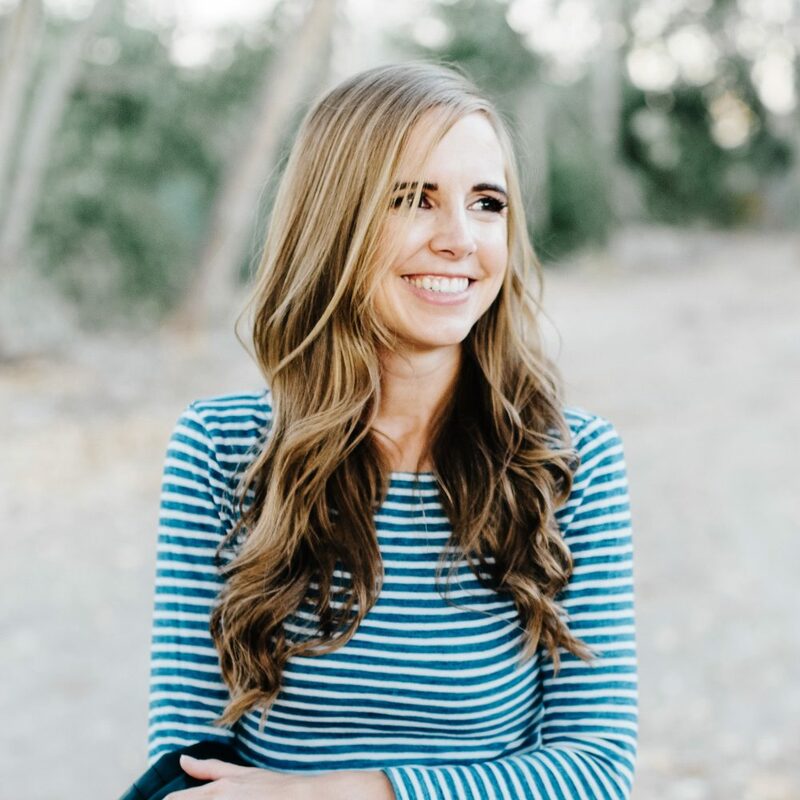 I loved that they can be served at any temperature, so I could make it whenever I had time in the afternoon, put in whatever was hanging out in the fridge (vegetables, ham, whatever kind of cheese), and almost always had leftovers for breakfast the next day. Alas, my husband isn't eating potatoes or bread or anything, and we now eat eggs every.single.morning. Since I don't want to eat eggs twice a day, no more frittata. Boo. Oh my goodness this looks delicious! Adding it to next week's meal plan. Ella sounds just like Margaret right now 🙂 We say "time for dinner!" and she says "I don't like that." Doesn't bother to find out what we're having, just assumes it will be unacceptable. Great idea, I was just wondering what to make tomorrow and I think I'll make this; I believe I have all the ingredients I need. By the way, I love your humor Janssen, your conversations with your girls make me smile. what do you give your kids when they don't eat what you have served? (i hope this doesn't come across as judge-y, i am just curious because i have a picky eater and i imagine i will have to deal with her refusing to eat what we're eating eventually). We had salad and grapes as part of dinner too, so they mainly ate those (eventually Ella did actually eat a few bites of the frittata). I don't really push them to eat new foods that much – not a battle I want to fight – but I also don't offer alternatives. They decide how hungry they are. Another win! I really enjoyed it (esp since I used a mandolin for the potatoes) but I think next time I'll serve it as a breakfast! Scott has already called dibs on the leftovers! 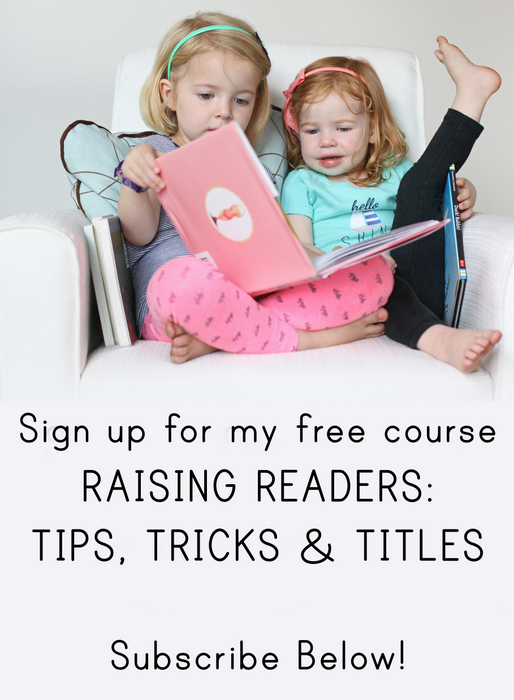 Love following your feed – making this tonight! Quick question for you – it seems that 1 3/4 lb potatoes will be pretty layered on a baking sheet. Do you just pile 'em up or cook in rotation? I spread them out the best I could, but they were still a little bit layered. Didn't seem to be a problem – good luck! Just made this, but used sweet potato instead of potato as it was what I had at home – delicious! My 2 year old was also a fan but requested more bacon haha.